with inscription 'H Holbein. del', and numbered 'NO 29' and with a code 'BBBUG', on the mount, (verso). Anon. sale, C.G. Boerner, Leipzig, 9-10 May 1930, lot 121, illustrated (as Anonymous German Master of the 16th Century). While almost certainly a design for metalwork, the intended form is uncertain. The moulded base and the position of the legs suggest a plaquette cast in relief, while the highly developed form of the Whore would indicate a design for a single-cast object, such as the stopper for an aquamanile. The technique of working over a grey ink offset, together with the use of two shades of grey ink with mauve wash is reminiscent of the practice of Hans Holbein the Younger, as is the form of the cup held by the Whore. Similar designs by Holbein include one for a cup design in the Küpferstichkabinett, Basel (C. Müller, Hans Holbein d. J., Zeichnungen..., Basel, 1988, p. 254, no. 82), and another for a cup for Jane Seymour in the British Museum, J. Rowlands, Drawings by German Artists..., London, 1993, p. 149, no. 326, pl. 214. 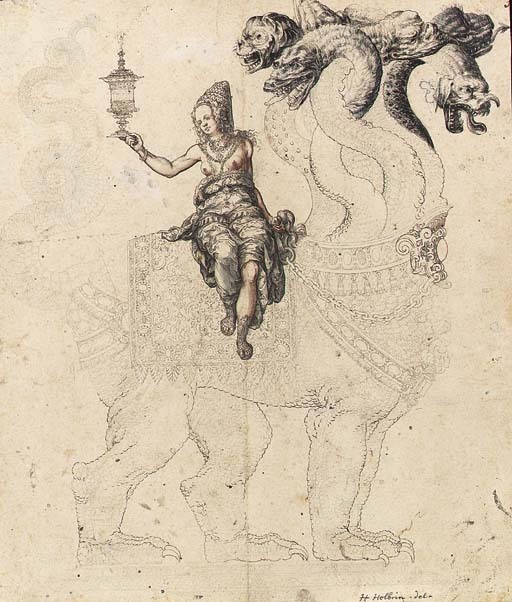 Also comparable, particularly in the form of the gem setting on the beast's chest, is a drawing by Abraham Bickhart of 1555-1565 from the Wyss Collection in the Berne Museum, R. Hasler, Die Scheibenriss-Sammlung Wyss, Depositum der Schweizerischen Eidgenossenschaft im Bernischen Historichen Museum, Bern, 1996, p. 183, no. 193.